Featuring screencaps from the Green Dragon scene, with jan-u-wine’s The Fairest Flower…. Time went on, and 1421 came in. Frodo was ill again in March, but with a great effort he concealed it, for Sam had other things to think about. The first of Sam and Rosie’s children was born on the twenty-fifth of March, a date that Sam noted. 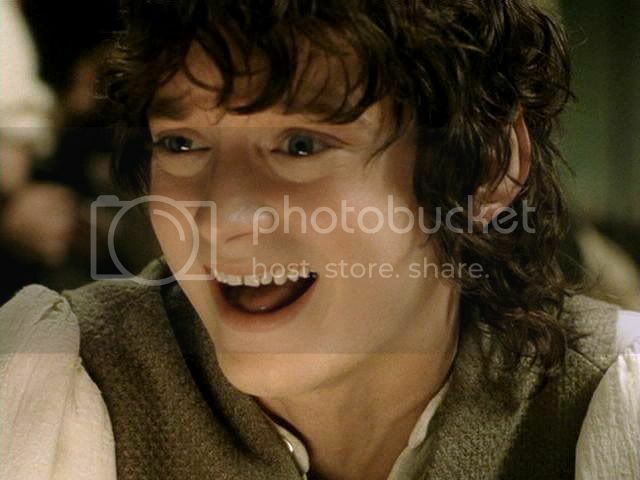 The book scene that Jan’s poem enlarges upon -- the birth and naming of Elanor -- isn’t included in the film, but I have borrowed frames of Frodo laughing from RotK’s Green Dragon scene. I am pretending they are images of Frodo as he learns of Elanor’s birth, an event that brings him joy in the midst of a difficult time. In the frames I chose, Sam has girded his loins and boldly risen from the table. 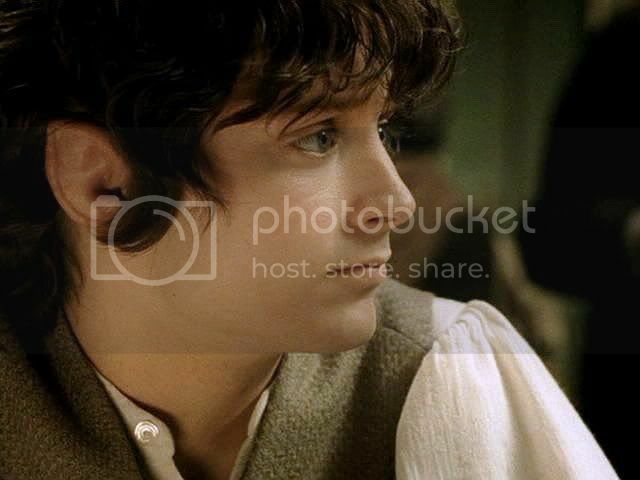 Merry has cued Frodo to watch as Sam, off-screen, presents his suit to Rosie Cotton. This was well-done by the filmmakers, I thought. The reaction shots of the heirs of the Tooks, Brandybucks and Bagginses are a treat to watch as Sam does whatever he is doing (probably snogging Rosie speechless). 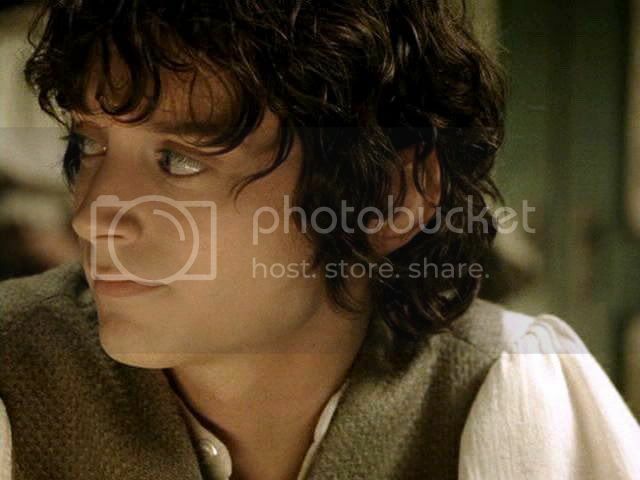 When I put aside what I know is coming before I look at Frodo in these frames, he really does look as though he had returned to his pre-Quest self in that moment. No wonder his friends (in the book, anyway) did not to know there was anything still wrong with him. Even if he could no longer feel happiness for himself, he still could feel happiness for his friends and their better fortunes. The frames have been tweaked for contrast and focus. from a Man's great height. in the bend of his arm. A girl child has graced us this day. as the lights of the distanced sky. Jan-u-wine's Lord of the Rings-based poetry may be found at LotR Scrapbook. Previous screencap entry ("Frodo Writes the Red Book, Pt. III") HERE. Next entry (Elanor is Born, Pt. II - Sam's wedding caps) HERE. What a lovely poem. And... The reaction shots of the heirs of the Tooks, Brandybucks and Bagginses are a treat to watch as Sam does whatever he is doing Part of me wishes we'd *seen* what Sam was doing, but part of me enjoys imagining it! Oh, I'd love to see it, too. Just because. Maybe they tried showing the scene but Sean just couldn't do it. Remember how much trouble he was supposed to have had giving Sarah McLeod (Rosie) that little sweet peck in the wedding scene? Worrying about how his wife would take it, etc. Just think how challenged he'd be by having to actually stride over there and really kiss her. If that's what he did. That's what I was imagining, anyway. I was imagining that, feeling heroic, even kingly, he'd follow Aragorn's example at his coronation (or with Billy Boyd in that hilarious Extra), and just grab the lass and snog her soundly. I was imagining that, feeling heroic, even kingly, he'd follow Aragorn's example at his coronation (or with Billy Boyd in that hilarious Extra), and just grab the lass and snog her soundly. She really was the reason and the reward for the whole thing, her and all the other children born into a better world, because of what Frodo and the Fellowship did. Well, get out your hankie, Alyon. 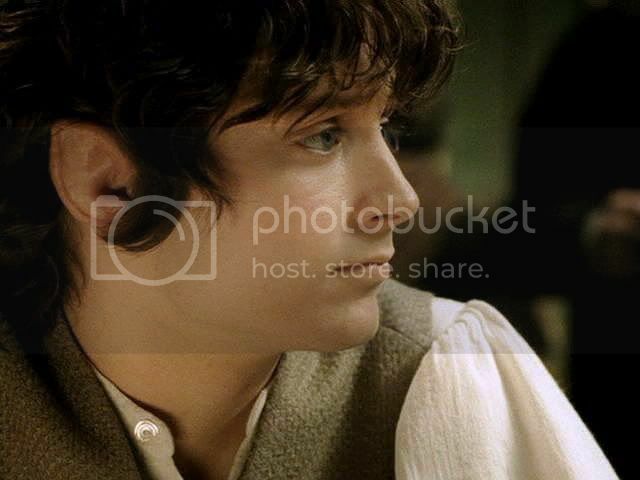 I'm posting the poem that details Frodo's darker, sadder feelings shortly. Gorgeous pictures, Mechtild. 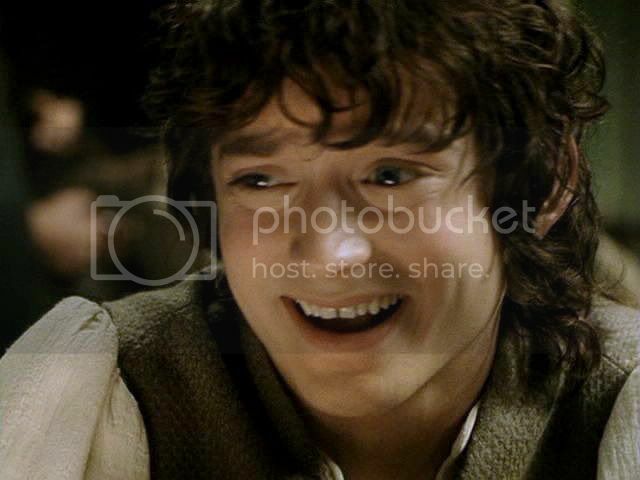 I do love the fragile beauty of Frodo in that scene, making the smile seem all the brighter when it bursts out. The first one is particularly lovely, and what a very beautiful poem. Thanks, Igraine. The lighting in the Green Dragon scene is exquisite. That whole scene is beautifully conceived, an example of the writers doing really good things with the limitations of film (i.e. not enough time to do the Scouring of Shire justice, etc.). 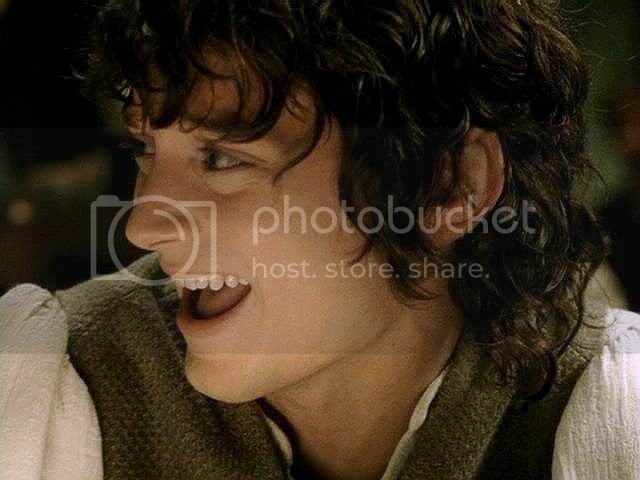 Well, in my mind, book-Quest Frodo did not look that much older, physically; he'd only just lost custody of the Ring; he wouldn't turn a hobbit fifty in a week (which is not old, by the way, it's still on the young side of middle-age). I imagined, though, that he'd seem older because he'd act older; more grave, more dignified, more world-weary, more sad; without the careless joie de vivre he'd had before. 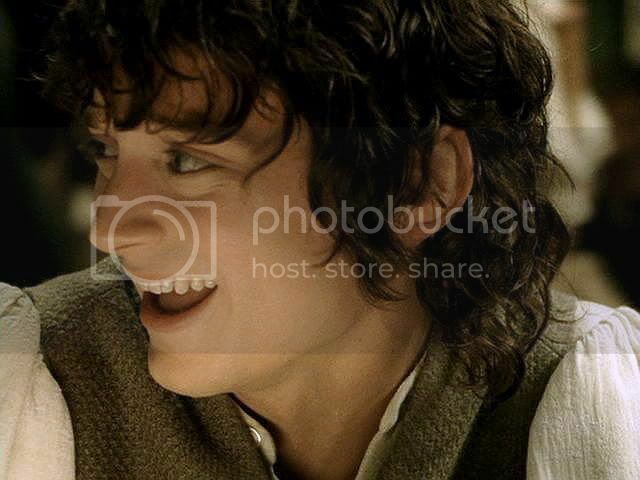 The thing that struck me about these caps of post quest Frodo is the fact that even when he laughs, he still has this air of weariness, of tired resignation, as though a laughter doesn't give him genuine pleasure anymore, just something he does out of habit maybe. Those bags under his eyes gave him a look of tiredness and general unhealth. 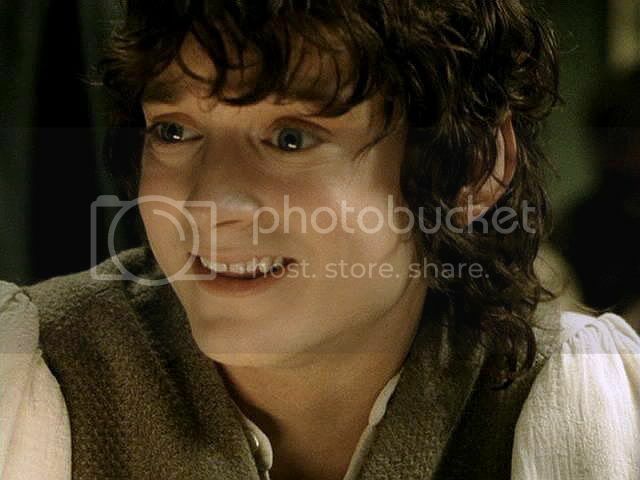 And I'm fascinated by the details these closeups give, like the weave of Frodo's weskit. Thanks for posting this, Mechtild. It is my pleasure, Illyria. Yes, he does look tired around the eyes. Probably from staying up all night writing, even the dull parts. Thanks so much for your insightful comments; they grace the page. Illyria's right. 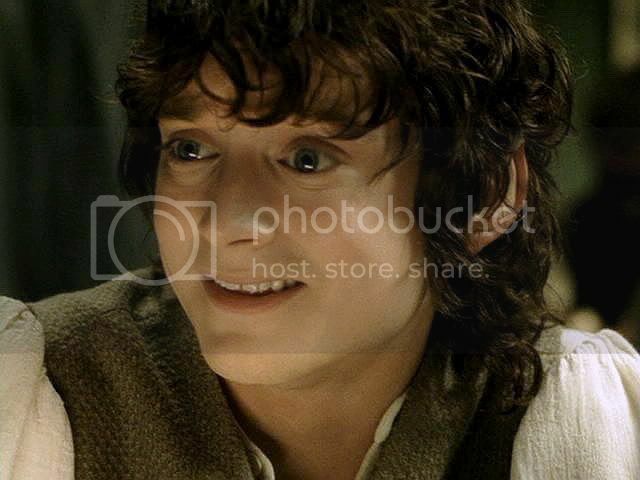 Frodo's eyes in this one has always kept me from really enjoying this scene. They look darker than usual.. and there is a look in them.. almost a desperate light that hurts to look at even though he is laughing. It doesn't show up so much in these screencaps but it is very striking in the scene itself. I think you are right, Taerie, although I do see something wistful creep in as the camera moves closer, something that's not there in the initial laugh. No? Your beautiful screen-caps together with Jan-u-wines's poem move me very deeply. Imho this is a Once-in-a-fandom moment - Your caps and Jan's poetry. How does one write such moving poetry? - it is certainly not somthing that you are taught. It is a gift. His method of writing stories was to assemble the pictures that appeared in his mind. As he explained in a lecture to the Library Association: "With me the process is much more like bird-watching than like either talking or building. I see pictures. Some of the pictures have a common flavour, almost a common smell, which groups them together. Keep quiet and watch and they will begin joining themselves up. If you were very lucky (I have never been so lucky as all that) a whole group might join themselves so consistently that there you had a complete story; without doing anything yourself. But more often (in my experience always) there are gaps. Then at last you have to do some deliberate inventing..."
~ quoted from p. 188 in George Sayer's "Jack: C. S. Lewis and his Times"
But jan's experience sounds very different than this. She sees the words themselves, already there. When I try to imagine it, I think of the words appearing on the Ring, or upon the doors of Moria, made of mithril. Amazing. Thank you Mechtild. It's fun to see how different authors approach writing. Oh, this poem is so wonderful! How Jan takes us through his bleak despair, and turns it with cheese of all things, as he focuses on what's before him, identifies with it unduly, determines it is what will fit the need at hand and turns to live in the spring day to be topped off with the new born Elanor, and the twists and joyful turns of life in the now. The bitter to the sweet. Gorgeous! he does look as young in those caps as in the beginning pics except for one thing--the lines under his eyes showing the puffiness of one who has mourned. It looks like they put very subtle lighter makeup under his eyes that would pic up the light, and angled the lighting to make the shadows follow those lines. Or they didn't make him up like they usually would, so the lines he was getting from his demanding schedule's lack of sleep would show. Dear LT.....how glad I am that you enjoyed this. It brought me much joy to write it....I am happy that you could share it with me.